I love mee goreng of any style, be it the dry and smokey Indian “mamak” version or the slightly moister yet full of “tze char” way of frying mee goreng which became popularly known as “Punggol Mee Goreng” here in Singapore. We cook it quite frequently at home too, pulling together elements which I like from the various versions I have tried before into a single plate. 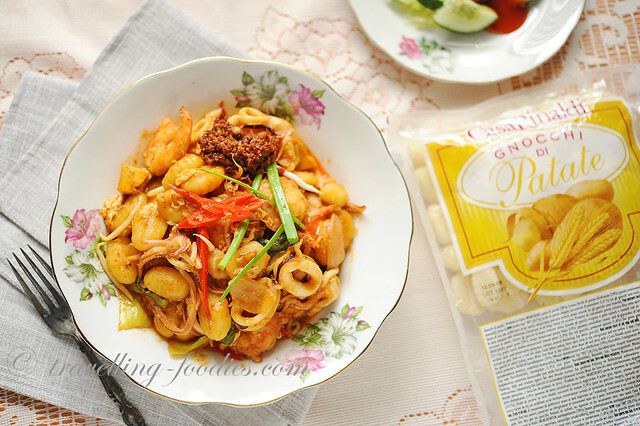 When I was given two packets of Casa Rinaldi’s gnocchi to create recipes with distinct “local taste” the first thing that came to my mind was “Seafood Gnocchi Goreng”! 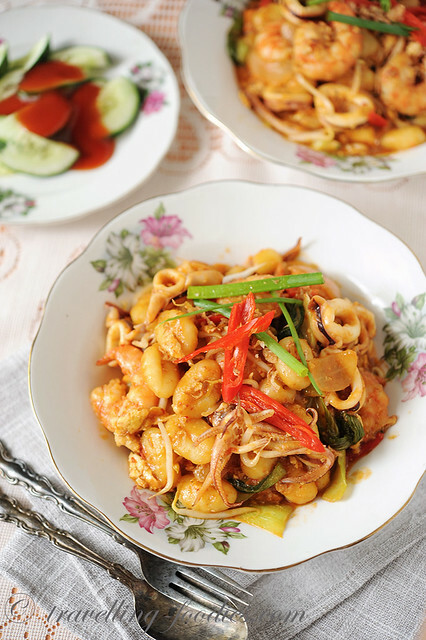 So the choice of ingredients to be used in a plate of mee goreng can be quite versatile. To experiment with my gnocchi version, I’d chosen the standard ones like bombay onions, prawns, squid, firm beancurd aka taukwa, not forgetting the veggies. The magic of a good plate of mee goreng likes in the sambal used and every eatery or restaurant have their own “homemade” version. If it is too trouble to make your own, the ready sambal paste from supermarkets are also acceptable but do choose one which has dried shrimp added. And instead of the standard yellow noodles, I’d used gnocchi of course! The process of frying the ingredients is fairly straightforward but one must constantly maintain the flame at high heat most of the time if you want the final dish to be nice and smokey. 2 servings can be fried each time at most. Mass produced and you get the “morning breakfast” version which ain’t bad eating at all, just not quite I have in mind of a good goreng dish. Bring a pot of water to boil and add gnocchi. Cook until they just begin to float. Drain and set aside. Push the gnocchi to one side and add prawns and squid. Saute until just cooked and the surface of the prawns turn lightly brown. Dish up the seafood and set aside. Add Bombay onions and saute until translucent. Add minced garlic and saute until fragrant. Add taukwa and mix the onions and garlic with the gnocchi. Add sambal and tomato sauce. Turn up the flame to high and stir fry until the ingredients are uniformly coated. Add eggs and lightly scramble them before mixing with the other ingredients. Add sliced red chilies, green vegetable and beansprouts and stir fry all the ingredients to mix well. Add a bit of stock from the edge of the wok if a wetter version is preferred. Season with ground white pepper, salt and sugar. 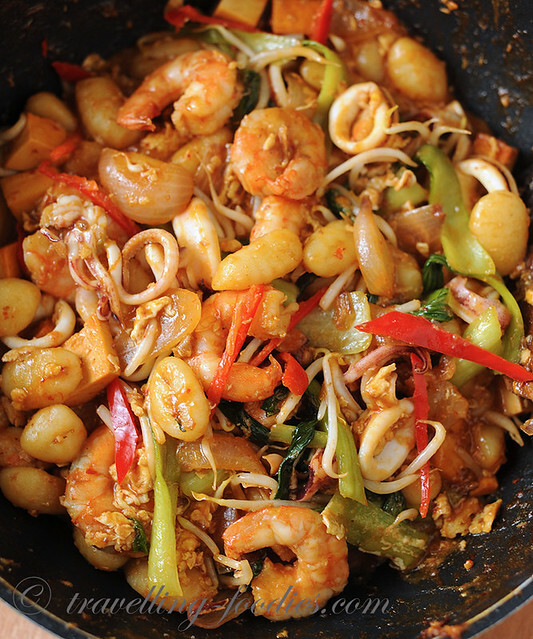 Return sauteed prawns and squid to the wok and give everything a good stir. Add spring onions, stir and plate up. Serve with halved calamansi lime and a dollop of extra sambal on the side. This entry was posted on September 18, 2017 by Alan (travellingfoodies). 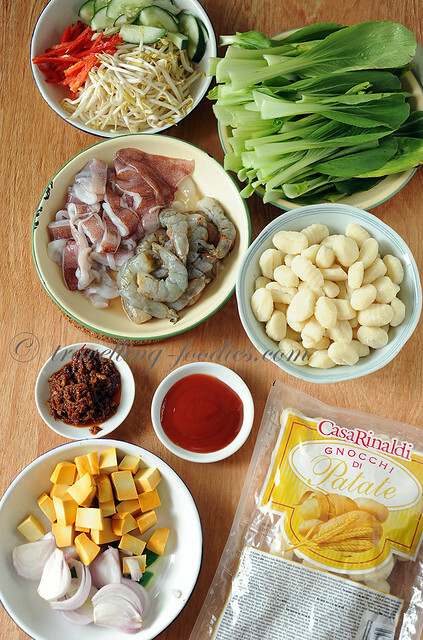 It was filed under General and was tagged with beansprouts, casa rinaldi, gnocchi, mee goreng, seafood, stirfry. 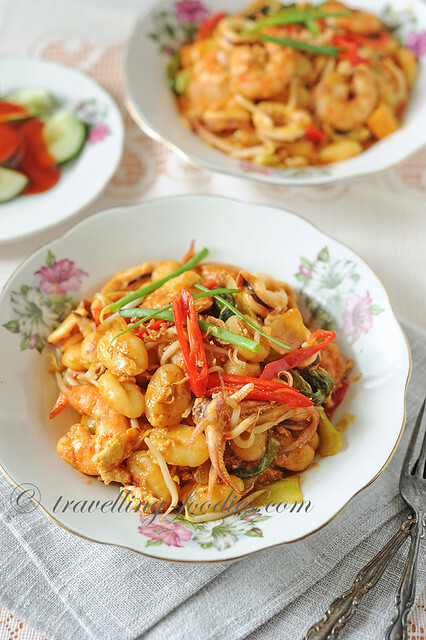 Thank you for yet another yummilicious dish but pls recommend what brand sambal chilli with dried shrimps ? Cant find at supermarkets leh. 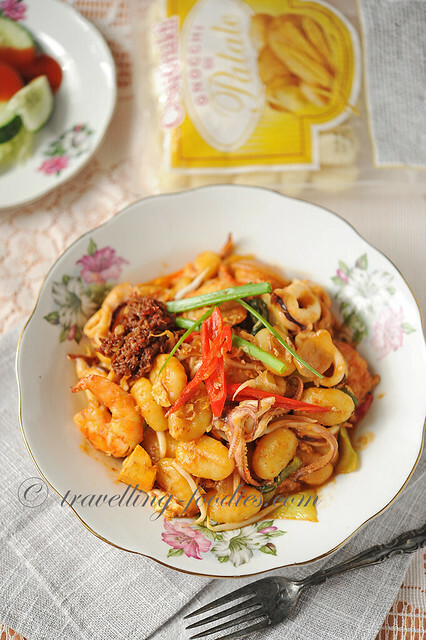 Look forward to your sharing on the brand of Sambal chili used here. Thanks.